Summer 2009 he was planning to make an attempt, but in a last minute effort to get the most horsepower, he burned a piston and did no have a replacement. Quite a disappointment. But last year he was well prepared, with plenty of spare parts. I should clarify that he is not driving the car himself, the aforementioned friend will do it, since Bertil’s back is giving him trouble and he requires surgery soon. The car is a 1966 Saab Monte Carlo with a 750cc race engine, triple side-draught Solex carbs putting out around 94hp. Bertil’s debut trip to Bonneville last year didn’t see him break any records for his class of vehicle. There were some mechanical issues that hindered the car. Aside from that, veterans of the salt flats say it takes between 3 and 7 years for ‘newbies’ to get familiar enough with the environment and conditions to build a car that’s capable. 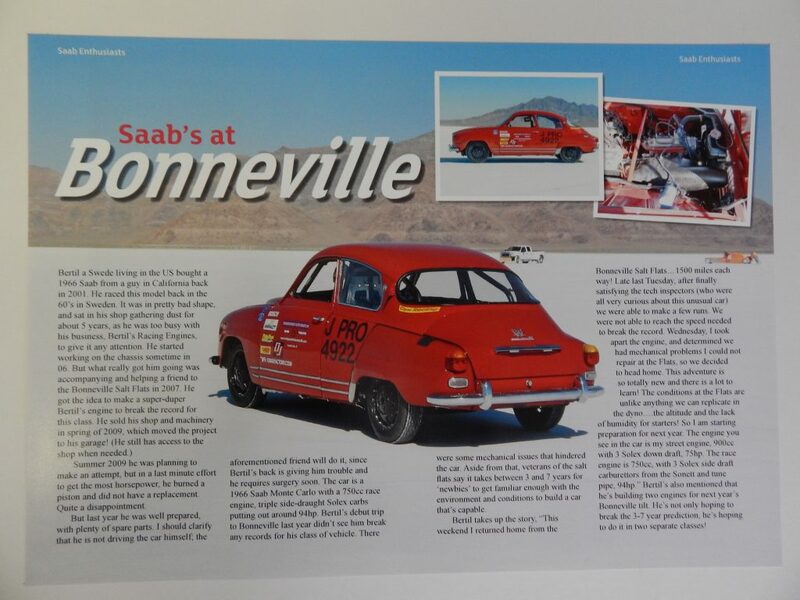 Bertil takes up the story, “This weekend I returned home from the Bonneville Salt Flats…1500 miles each way! Late last Tuesday, after finally satisfying the tech inspectors (who were all very curious about this unusual car) we were able to make a few runs. We were not able to reach the speed needed to break the record. Wednesday, I took apart the engine, and determined we had mechanical problems I could not repair at the Flats, so we decided to head home. This adventure is so totally new and there is a lot to learn! The conditions at the Flats are unlike anything we can replicate in the dyno… the altitude and the lack of humidity for starters! So I am starting preparation for next year. The engine you see in the car is my street engine, 900cc with 3 Solex down draft, 75hp. The race engine is 750cc, with 3 Solex side draft carburetors from the Sonett and tune pipe, 94hp.” Bertil’s also mentioned that he’s building two engines for next year’s Bonneville tilt. He’s hon only hoping to break the 3-7 year prediction, he’s hoping to do it in two separate classes!